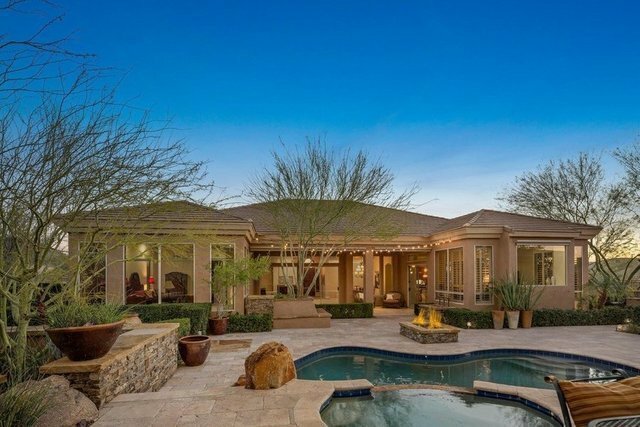 Gated Sonoran Estates, one of the best kept secrets in North Scottsdale! This beauty of a home epitomizes Arizona living and is situated on almost an acre premium lot with impressive views of the McDowell Mountains. Graced with an easy neutral color palette & expansive windows throughout that capture the vibrant colors and natural light of the outdoors. This spotless 4 bed/3.5 bath home features a split floor plan with ample sized living spaces, well thought out appointments and tall ceilings to create an inviting atmosphere that flows consistently throughout the home. BEST of all you will live outside with a deep covered patio, multiple seating areas, fireplace, a beautiful tiled pool/ spa & a great entertaining ramada with built in BBQ ... privacy, lovely landscaping, & serenity now!